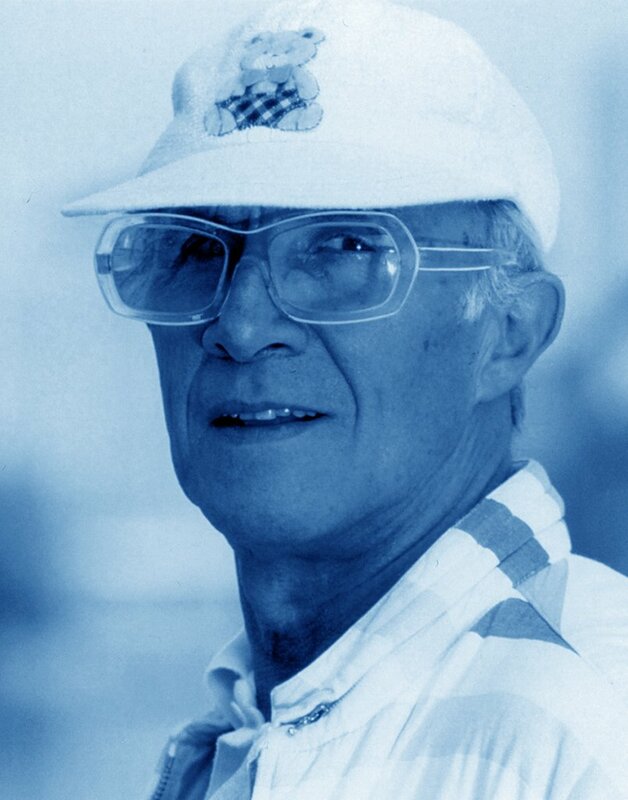 André Courrèges was born in Pau in 1923. A keen sportsman, with a great interest in architecture, he attended the Ecole des Ponts et Chaussées, before going to Paris. In 1948, he met Monsieur Balenciaga and joined his Couture house in 1950. 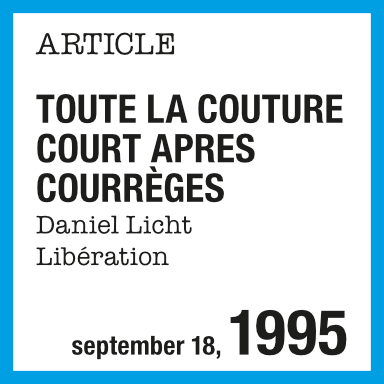 There he met Coqueline, his “complementary creativity”, with whom he opened his Couture house in 1961. The trouser suit in 1962, the little white dress in 1965… His spare, structured style offered woman a new life style. 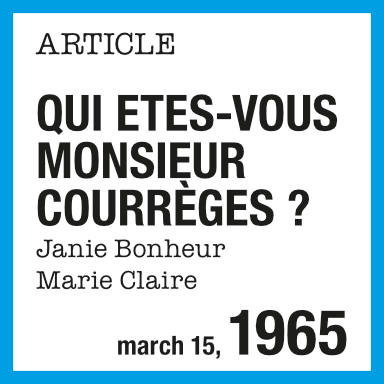 In 1967, he invented “Couture Future”, designed to be made for as many women as possible while keeping the “Haute Couture” quality, which was sold in his own boutiques. 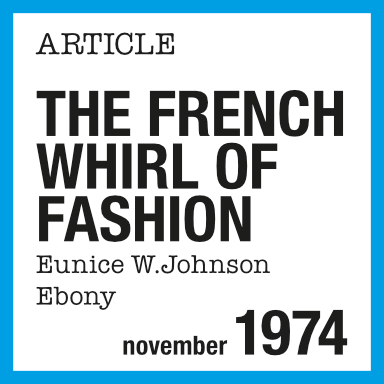 The Second Peau/Second Skin tights came into being in 1969, followed by his first perfume, Empreinte, and the futuristic “dress-making” factory in Pau in 1972. 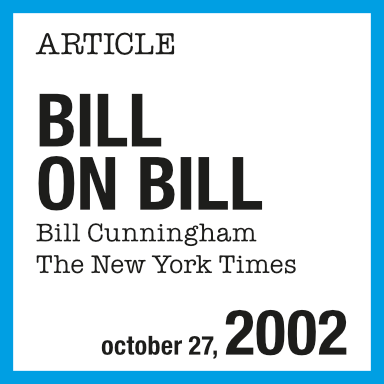 In 1980, he extended his research to design and defined concepts associated with the human being’s everyday surroundings. 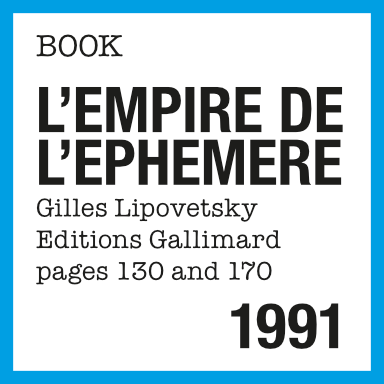 In 1982 he came up with La Cité Lumière/The City of Light, an architectural translation of his philosophy. In 1995 he left Coqueline in charge of the Couture house, and in 1996 their daughter, Marie, designed and established the Café Blanc. 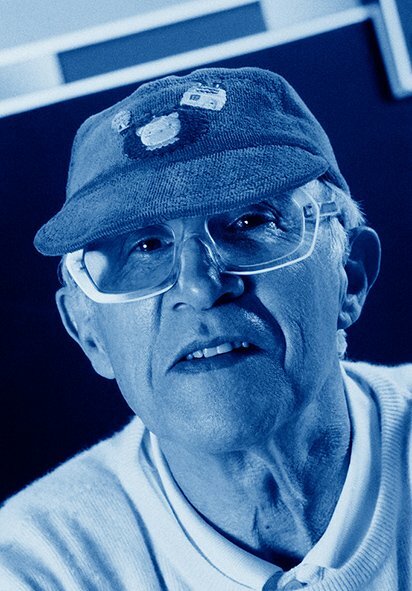 Between 1997 and 2008 he devoted his time to painting and sculpture; his works were exhibited at the FIAC, as were the first three prototypes of electric cars at the Parc André Citroën in Paris… André Courrèges proposed not so much a fashion as a colourful and joyous way of life: “Couture”, the home, perfumes, sportswear, visual arts, accessories… he offered human beings what they will need tomorrow. 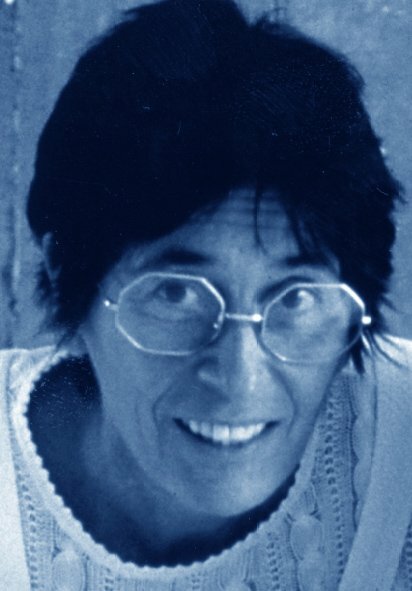 Coqueline Courrèges was born in Hendaye in 1935. At the age of 14, she resolved that she would not let anyone make decisions about her life, and she “went up” to Paris to sit for her training certificate in dress-making. 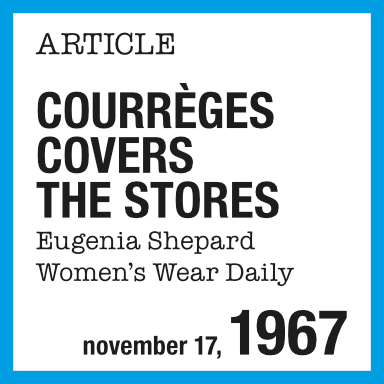 In 1952, she joined Balenciaga, where she met André Courrèges. 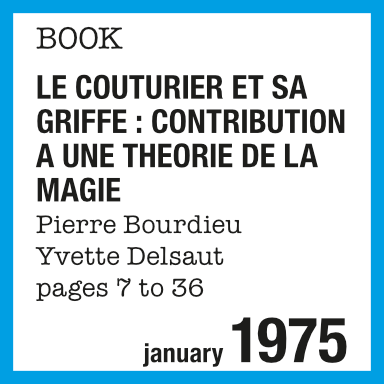 She enrolled in the commercial register as a dress maker in 1955, and in 1961 André and Coqueline together opened the “Couture house”. They have remained together for the rest of their lives. 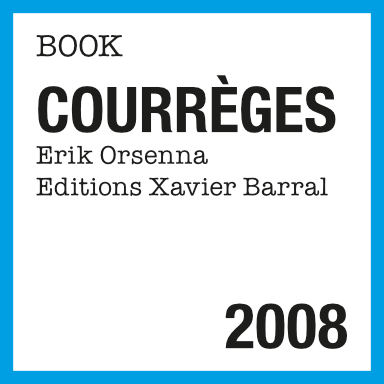 Between 1995 and 2010, Coqueline became the sole director of the Courrèges Design and Courrèges Parfums companies. She also re-opened the factory in Pau, launched the perfume 2020 in 1997, and put on events mixing future fashion and the new technologies. 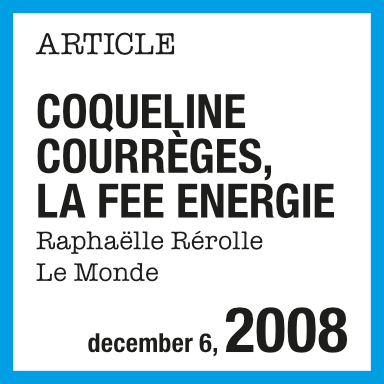 Deeply interested in the sciences and innovation, since 1995 Coqueline has been working with scientists on cellular biology, with an eye on dressing tomorrow’s human beings. 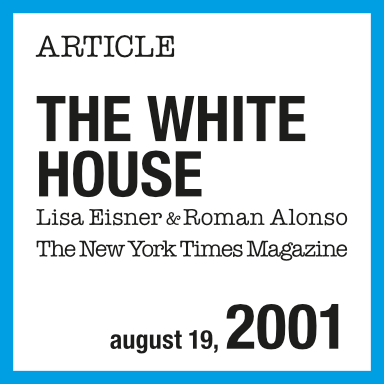 In 1999, she developed a project that had been dear to her for many years: electric cars, an initial prototype having already been made and presented during the 1968 fashion show. Between 2000 and 2008, five prototypes of 100% electric cars saw the light of day and would demonstrate, at international competitions from Germany to the USA by way of China and Japan, that changing energy to respect the planet is possible! 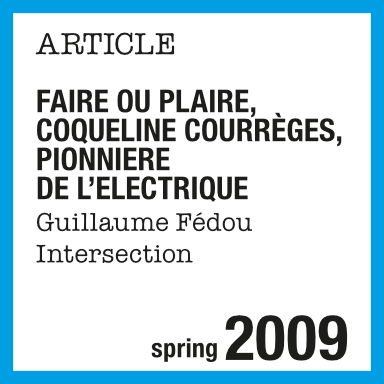 In 2006, the Salon des Inventions in Geneva awarded her a “patent” for her electric cars. 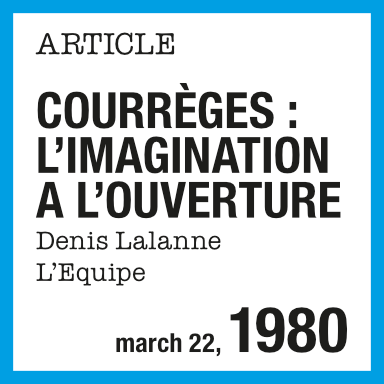 Since 2010, Coqueline has devoted herself to the defence of André Courrèges’s intellectual and moral rights, and the development of projects of the andré courrèges “patrimony” company. The goal was achieved in 2016, dreams were met, and 2018 saw the fulfillment of her works thanks to solar energy. relieving them of their artifices and appearances, and letting them live in freedom in light, the basis of everything, that whiteness which gives birth to colours. Body, time, space, light, colours, movement, the finite and the infinite. He tries to define a contemporary style translating a way of life, perpetuated in time: a healthy way of life, clearly defined and joyous, which stimulates body and mind and brings them together, a natural elegance because it comes from within, an eternal youth, for those who move forward never grow old, a way of living in the present and imagining the future in a joyous way. 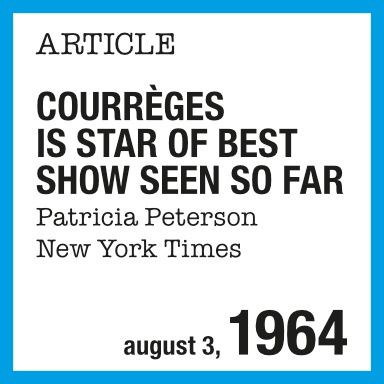 andré courrèges “patrimony” is the reflection of the philosophy of André and Coqueline Courrèges. This philosophy lives through their deeds. 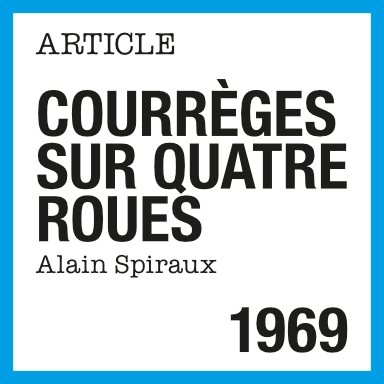 André courrèges “patrimony” guarantees the protection, representation and permanence of the name, image and works of André and Coqueline Courrèges in various arenas: publishing, visual art productions and exhibitions, photos, drawings, paintings, sculptures and architecture, as well as film, TV, digital, literary, graphic and musical works. 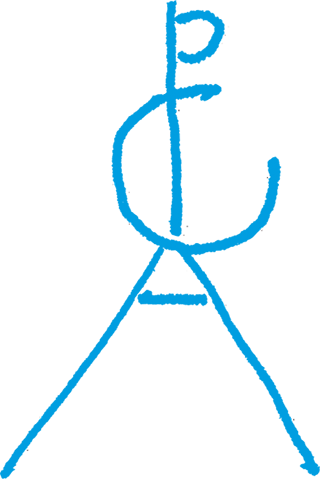 The company’s brief also includes undertaking “actions and works” to encourage the protection of our planet. In addition, it designs and develops different art projects. 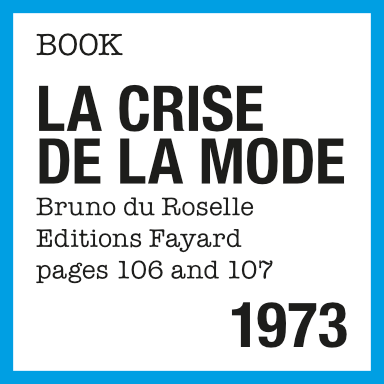 So the futuristic studio in Neuilly, offspring of the “City of Light” imagined by André Courrèges in 1982, is the place where dreams and tangible projects rub shoulders: a book and a film about the work of André Courrèges and the only development to date of the “C module”—the latest innovative prototype of a solar charging station for 100% electric cars, offering the possibility of producing, storing and selling “solar electricity”. 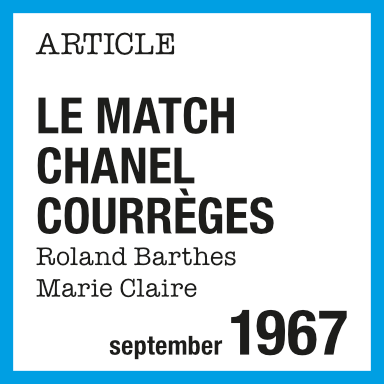 The andré courrèges “patrimony” company is independent of the Courrèges group, and the sole holder of the moral and patrimonial rights attaching to all the works of André and Coqueline Courrèges. It handles the management of the moral rights of intellectual property.